With the long summer evenings finally here, it’s only right you make the most of them. 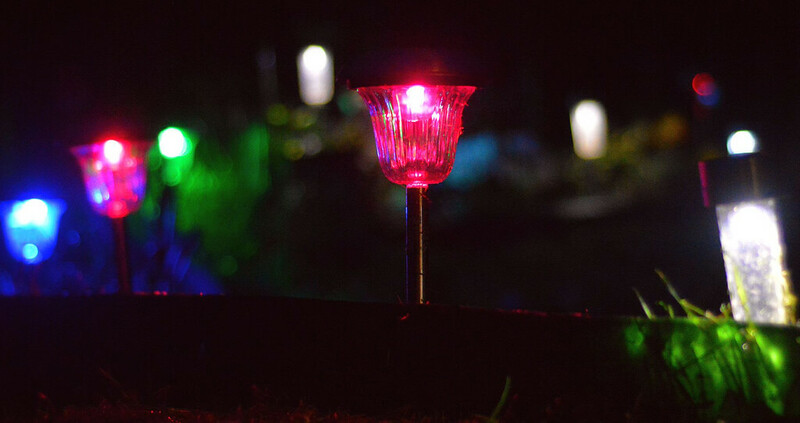 With garden solar lights, the possibilities are endless, from security to decorative to budget! Solar lighting is a popular option for many homeowners as they are easy to set up, cost nothing to run and require very little maintenance. Solar garden lights work by storing the suns natural energy it receives in the day, into a battery, and automatically turns on at dusk. In the day they turn themselves off, making them the most eco-friendly lighting solution for your home. You are sure to get your money’s worth from solar garden light as they will last approximately for up to 600 charges. That works out to be roughly 2 years worth of eco-friendly lighting. The LED light in solar last up to 10 times longer than regular incandescent bulbs and use up to 90% less energy. They are very bright and a reliable light source for your garden to use all year round. They are a fantastic alternative to pricey, conventional incandescent lights which are not energy efficient and more expensive to run. Outside lighting for your property is a necessity when it comes to warding off potential intruders. Solar lights present a low maintenance and easy to install route to keep your home lit up and protected. Coming in a variety of forms, from hanging hooks, to wall mounted PIR lights, to even path solar lights! Solar PIR flood lights are proven to be extremely bright and powerful security lights. Although solar security lighting is more expensive than regular solar garden lighting, they are a cost effective deterrent. Prices start from £30 for a solar powered security light, like this twin security light from B&Q. The most common use for solar lighting in your garden is decorative. Decorative lights are great for mood lighting and prove to be an extremely popular choice at Christmas. Make your garden the focal point all year long by illuminating a tree with uplighters, or hang fairy lights around for an evening BBQ. You can also get solar decking lights to build into the flooring for a spectacular effect. There are a wide variety of decorative solar lights to choose from, including imitation flowers, crackle globes, string mini lanterns, solar gnomes and fence mounted lights. Prices for decorative solar lights vary, depending on what you are looking for; a small set of solar string lights can cost an average of £5-10. If you’re looking to snap up a few solar lights for your garden this summer, beware of low quality lighting solutions. Always remember to buy from a reputable retailer who has had the products weather tested and has an IP rating. Don’t be tempted by cheap prices online from smaller retailers – cheap solar garden lights will mean lower quality light output. The best solar bargain buys are the stakes, that also double up as path way lights for their garden. A pack of 6 solar stakes average around £10-15 from a reputable retailer. Try your local supermarkets or DIY stores to see what solar lighting solutions they have to offer. Position your solar lights in a location which receives a lot of sunlight. The best spot for them is south facing. They will not charge to full capacity if they catch more shade than sun! Remember to keep your solar panels clean to maximise on efficiency. 8 hours of direct sunlight is advisable for outside solar lights. Don’t place your solar lights near an outside light as this may confuse the sensor on them and they won’t come on at night when you need them to! Make sure your solar lighting is weatherproof and waterproof. Remember to check the IP rating to find out if it is suitable for your needs. If you want some more tips for your garden, take a look at our outside lighting guide!